La Manche Provincial Park on Newfoundland’s East Coast Trail. ST. JOHN’S, Newfoundland — If breakfast says a lot about a place, St. John’s offered fortitude. Salted cod cakes, fried eggs, butter-drenched toast and a touton (savory fried dough) filled my steaming plate at the Celtic Hearth. In Canada’s Eastern Provinces, even summer days can bring stinging winds, wild seas, and bracing chills. So it made sense that Newfoundlanders have made hunger the easiest predicament to quell. “No one is going to go hungry,” we assured each other in preparation for the East Coast Trail. With a group of women, I was embarking for a week on this world-class hiking route. Together we sorted great mounds of dried food and energy bars, skimming excess weight from our packs, though in truth these comestibles were mostly traded like lunch box treats. Thru-hiking is going mainstream. Record numbers of backpackers have been crowding the Pacific Coast and Appalachian trails thanks to “Wild” and “A Walk in the Woods.” Yet, despite recognition by National Geographic as one of the world’s best adventure destinations, Newfoundland’s East Coast Trail remains virtually unknown to Americans. 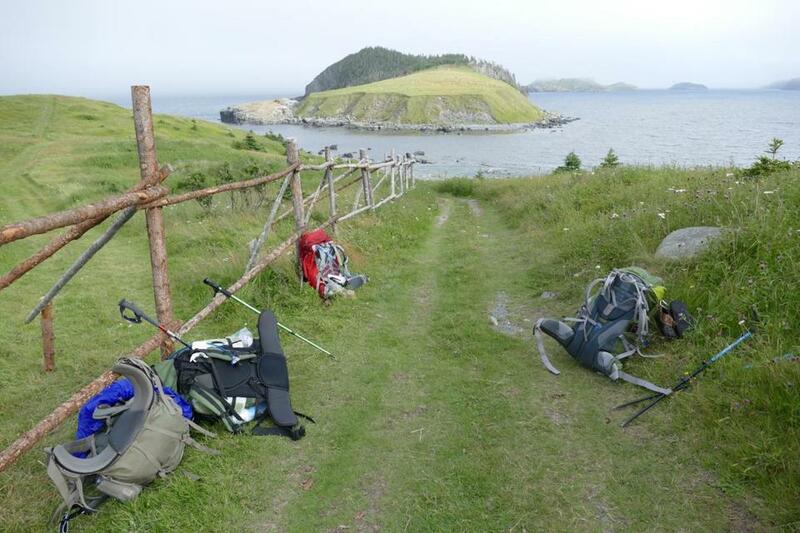 The 165-mile trail connects 30 communities, from Cape St. Frances north of St. John’s to Cappahayden on the southern shore, with plans to mark trails even further south. It follows the rocky coast, through villa`ges settled by Irish and West Country English, abandoned settlements, lighthouses, and historic sights. Though there’s nothing overly technical about the trail, the topographic maps denote a constant tide of ups and downs. Just a year before, while we were still strangers, the trek was arranged as a collective experience after a writing conference in St. John’s. We planned to hike the Avalon Peninsula 57 miles from Blackhead, outside St. John’s, to just beyond La Manche Provincial Park. We left a food drop in Witless Bay, a midway stop where we would take a day off to watch puffins from a boat tour in the Witless Bay Ecological Reserve and sleep in a B&B. 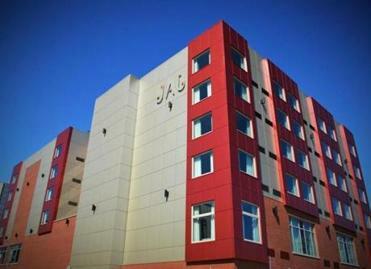 The hotel, which features rooms with a rock star theme, sits near the busy waterfront of St. John’s, the capital of Newfoundland. We had no guide but a stack of East Coast Trail topographical maps and the advice of local Carolyn Cook, an avid hiker and trail runner who knew the route in all seasons. In our group were 11 women from the US, Canada, South Africa, and Somalia, ranging in age from our thirties to our fifties. Two were poets, the rest were writers with specialties as diverse as science fiction and travel. About a third of us were experienced hikers and backpackers. Most had been training for the adventure. For me the trip was a bit of a test. Though I am an experienced hiker, an injury had kept me from backpacking for several years. Could I carry 35 pounds for a week? Craving the feeling of being out on the trail, I did my physical therapy and went buoyed along on the enthusiasm of the others. The first step was walking to breakfast, shouldering my load past the rainbow houses of Jelly Bean row, through streets pitched steeply toward the container ships and oil rigs anchored in the harbor. St. John’s wooden row houses and shady streets would not be out of place in New England, and certainly the craggy coves were a double take of Maine. But there was something wilder here. Captain James Cook, who would later earn fame circumnavigating the globe, honed his skills surveying Newfoundland’s jigsaw coastline Newfoundland coast in the 1760s. A shuttle van dropped us off at Blackhead to avoid the highway heading out of the city. On the trail we found not another soul. There was birdsong, the rhythm of boots striking roots and rocks, and my own breath as I humped up hills shod in tuckamore, the wind-stunted forests common to these high latitudes. By midday we reached one of Newfoundland’s main attractions. Cape Spear, the easternmost point in North America, is a rocky headland with a clapboard lighthouse overlooking a luminous streak of cobalt sea. From 1836, it’s the province’s oldest lighthouse. There’s a palpable spirit of promise in its reach. It’s just 1952 miles across the north Atlantic to Ireland, which turns out to be closer than Montreal. The site served as a gun battery during WWII, with underground passages and bunkers defending one of the allied forces’ essential ocean convoy routes. Now it was jammed with visitors streaming forth from a large parking lot. Despite the breakfast feast, we picnicked, eager to lighten our loads. My remaining cod cake tasted good, though I wished for a spot of hot sauce. Tour buses came and went and two members of our group decided to separate for an easier alternative. We became nine. The trail south offered some of the easiest walking of the trip, a narrow sloping path through tufted grass lit along the cliff tops. Clouds raced over us and the miles passed. In this perfect patch for daydreaming I hardly noticed the others dawdling, bent over on the trail. They had found something. Cloudberries, known locally as bakeapples, are tart orange fruit native to Newfoundland. They dissolved in one billowy bite. There were wild strawberries too, tiny and sweet. Though we made poor time to camp, the walk turned out to be one of the most satisfying stretches of the trip. So we were overconfident the following day when we arrived to the picturesque cove of Petty Harbor for lunch. We lingered over crisp fish and chips, took restroom bird baths and binged on Wi-Fi. Leaving town, our path took us up a steep residential street to a dead end facing a sheer forested bank. “That’s your trail,” assured a homeowner from her deck, before we even asked. She had seen our kind before. The view at Tor’s Cove. Gaining the windswept barrens required scrambling at times. We hoped the hardest part was over. The heights sprawled before us, symphonic in scale and dotted with tiny inland ponds and solitary boulders perched above the grey Atlantic. While the terrain had evened out, it was far too exposed for camping. That meant that there was still far to go. So we pushed on to Motion Path, managing to startle an enormous bull moose grazing in a stream bed before descending Hartes Point ridge and its cascade of slick rock terraces that demanded solid footing on slanted rock. The group spread out and the day dissolved into night. It took several trips with a headlamp to help the last stragglers through the final bout of scree and into camp. I was beginning to see what Captain Cook had been up against. Rain settled in for several days, slipping a veil over the landscape. For us it was a layer of mystery. We made quiet progress over creaking boardwalks shouldered in grey mist, never knowing what lay ahead. From the fog emerged pink rhododendron blooms and shadowy forms of giant sea stacks, slick daggers plunged into the rushing surf. The whoosh of the north Atlantic was constant. Newfoundland’s rich folklore is peopled with fairies, woodland tricksters who remain unseen by most. Walking in a sunlit forest covered in tiny goldthread blooms, it was hard not to feel like intruders in their world. When looking for a campsite, the heath swallowed my leg up to the hip. Tent stakes vanished. While we never directly blamed them, the fairies were ever present in our musings over these misfortunes. Then, one wet morning my friend Wendy and I lost track of trail markers while deep in conversation. We considered doubling back but continued along a beach where we thought we saw a sign. But it was just a slightly stale offering on a flat rock: a paper plate holding a dozen hotdogs dressed in mustard. We photographed it to ensure it was not a mirage. It seemed to say that we were on the right track. We respected the fairies but left their offerings. Those stories about them never turned out well. Most of the trail produces adequate signage so getting lost isn’t a problem. Each section is divided into day hikes with signs at town trailheads for taxi services. Amongst the most popular stretches are the Spout path, named for a geyser-like feature where surf blasts skyward through a rock channel, and bucolic Tors Cove. In Freshwater Bay, wild grasses and rosehips have reclaimed the stone foundations and garden walls of the former fishing village, a site used as early as the 1500’s. It’s one of many abandoned settlements along the Newfoundland coast. 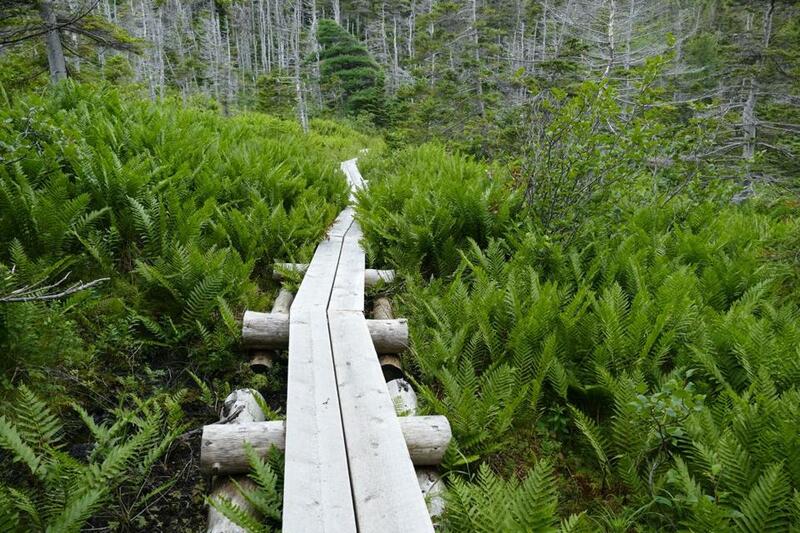 The East Coast Trail is also a story of changing economies. Though Newfoundlanders have always pegged their settlements to the coast, the trail was created two years after Newfoundland’s fishing industry had tanked following the 1992 cod fishing moratorium. The idea came from a West Coast transplant who imagined a complement to Vancouver’s popular West Coast Trail. Volunteers carved out the first 78 miles. Eventually, the provincial and federal government responded with most of the funding and the trail was formalized. Despite having little public support at first, thru-hiking offered a vision for a nascent industry. Fast forward twenty years and tourism has become a billion-dollar industry for the province, with the East Coast Trail contributing 3.5 million Canadian dollars annually, according to the latest survey (2013). Carrying an assortment of aches, we arrived to La Manche Provincial Park on our sixth day of walking. Over the past week we had overdosed on oatmeal, camped under saggy, soaked tents, and waded through mud bogs on an inland track to avoid the coast’s wild headwinds. So we were euphoric to cross the 165-foot suspension bridge that heralded Herring Cove like a marathon finish line. We had made a final adjustment to our plans to end the trip here, enjoying a full day to explore the park before hiking out to the trailhead. It turned out to be the right call. Cupped between two waterfalls, lower La Manche pond makes a picture perfect swimming hole. With little hesitation, we rid ourselves of soaked layers and swam counter-current under the cascade spray, savoring the brutish massage. The following day, several of us explored the trail continuation without backpacks, savoring the ease of the climbs through dense ferns, views of a bald eagle and the final vistas of exposed ridges slammed by sea spray. At sunset a family of five river otters swam under the bridge, fishing and cavorting under our noses. Though one of us had cut her bare foot at the swimming hole, we were otherwise ending on a high note. We had made it, with blood, sweat, and more laughter than tears. We camped amongst the slate foundations of the former settlement and discussed the highs, the lows, and the things we would do differently: share more gear, skip certain cardboard meals, and bring rum, as one wise woman had. Because there would certainly be a next time. 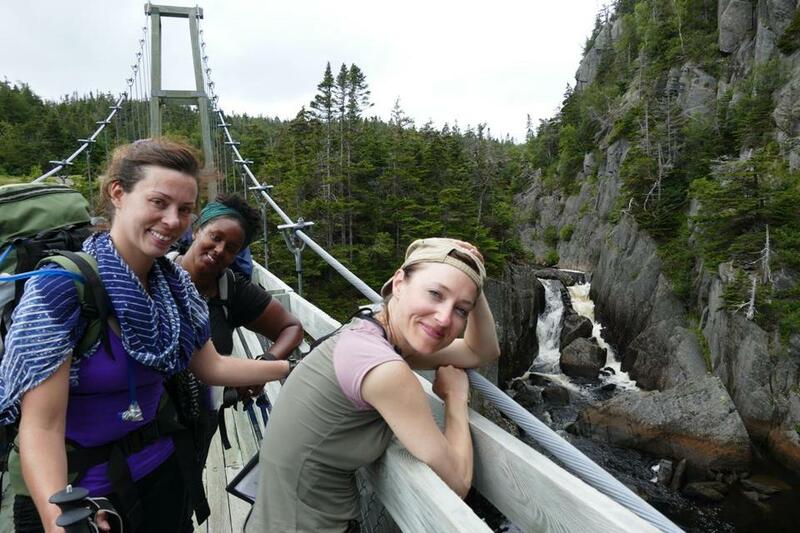 The group enjoys a relaxing moment near the end of the East Coast Trail hike.